UPDATE: Klipsch launches Mode M40 noise-cancelling headphones | What Hi-Fi? The £300 pair of over-ears offers battery-powered cancellation of external sounds - designed so you can enjoy the music, not the noise of your commute. As you can see from the picture, the M40 also features in-line controls and a microphone - all designed to work with a wide range of Apple portables, including the iPhone 4 and 4S. The Mode M40 over-ear headphones are a dual-driver design, featuring a 4cm mid/bass driver and a 1.5cm tweeter. They weigh 356g. Klipsch has launched its first pair of made-for-Android earphones. First previewed at IFA, the Image S4A are now on sale for £90. With the same look, feel and driver technology as the multi-award-winning Image S4 and S4i models. The 'phones are compatible with devices running Android 2.2 OS and allows complete music and call control when used with the free to download Klipsch Control App. The Klipsch Image S4A are on sale now for £90. 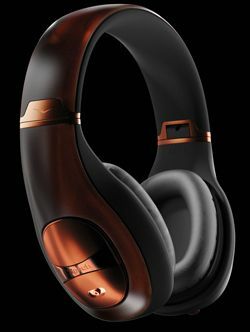 Klipsch has launched five new pairs of headphones at IFA in Berlin. The new models include the company's first active noise-cancelling headphones and first for-Android model, plus three new Reference earphones. The Mode M40 headphones (pictured) claim 45 hours of active noise cancellation from a single battery and boast Klipsch's most "fashion-forward" design. They're due out in October for £300. Joining them will be the Image S4A for Android earphones. Based on the Image S4 earphones, unsurprisingly, they come with the mic and remote control functions for compatible Android devices. You'll need to download the free Klipsch Control app in order to activate the voice and remote control features. Due in October, they'll cost £90. Finally there are three new Reference models. The Reference S4, S4i (for iPhone) and ONE models take their design cue from the company's floorstanding Reference speakers. With signature copper colour treatments, new cabling and modified voicing, there's no word on release dates or prices for these as yet.